Plantation Teak for Developers, Architects, Designers. Teak On Demand service by Novelteak. 100% FSC certified teak from Central America. This service has been designed for Architects, Design studios and Construction companies in Costa Rica, Central América & Caribe looking for a LEED certification -or not- that would like to add the natural touch of FSC™ teak to their projects. Teak On-Demand service will bring your company FSC™ certified teak wood from our own plantations, a professional project manager and a seasoned teak expert partner that will ensure manufacturing, installation and maintenance is delivered as expected. Aug-2015. US Corporation in SJO, Costa Rica wanted to create the perfect environment for their employees in their corporate office using sustainable materials. Design: Gensler Architects, Teak Expert Partner: HDM Costa Rica. Products designed and installed: 100% FSC™ Novelteak Cabinets, Table Tops, Booths, Kitchen, Sofas and more. Oct-2015. US Bank with regional office in SJO, Costa Rica was willing to reinforce team working environment plus add natural products. 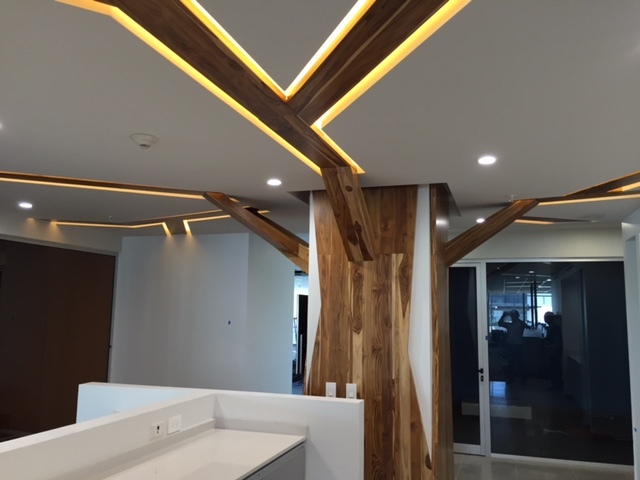 A tree built in FSC™ Novelteak was created that grew through the whole office plus natural wood benches and work tables were created to create a great work environment. Design: Gensler Architects, Teak Expert Partner: HDM Costa Rica. Products designed and installed: 100% FSC™ Novelteak Benches, Table Tops, Tree. Dec-2015. Local major restaurant chain in Costa Rica decided to renew look & feel of stores. Started in December with the decision of adding natural FSC™ teak products in lieu of cold materials to create a warm environment for their customers. Design: HDM Design. Teak Expert Partner: HDM Costa Rica. Product: Table Tops.